Garry Buckley's second-half header gave Cork a Premier Division victory over the Candystripes at the Brandywell. 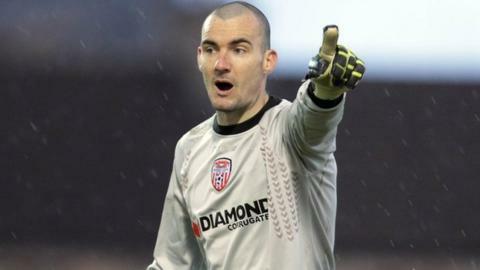 Derry pair Ruaidhri Higgins and Stephen McLaughlin were denied by keeper Mark McNulty before Gerard Doherty superbly kept out Shane Duggan's header. Cork scored the only goal on 68 minutes with Buckley heading home from a corner and the Leesiders held firm as Derry pressed for an equaliser. City's Ryan McBride was red-carded in injury time for a rash challenge. Cork have moved to within two points of fifth-placed Derry after an entertaining league encounter. Doherty's save was the highlight of the first half, the City stopper pushing Duggan's header over the bar. Vinny Sullivan squandered Cork's best opening when he shot wide while Derry strikers David McDaid and McLaughlin had efforts cleared off the line. Buckley netted from Kevin Murray's knock-down while Barry Molloy headed over as the hosts chased a late equaliser. McBride was shown a straight red in the foruth minute of added time following a tackle on Buckley. In Friday night's other games St Pat's Athletic won 3-2 at Bohemians, Shamrock Rovers and Shelbourne drew 2-2, UCD beat Dundalk 2-1 and Drogheda were 3-2 winners at Bray.